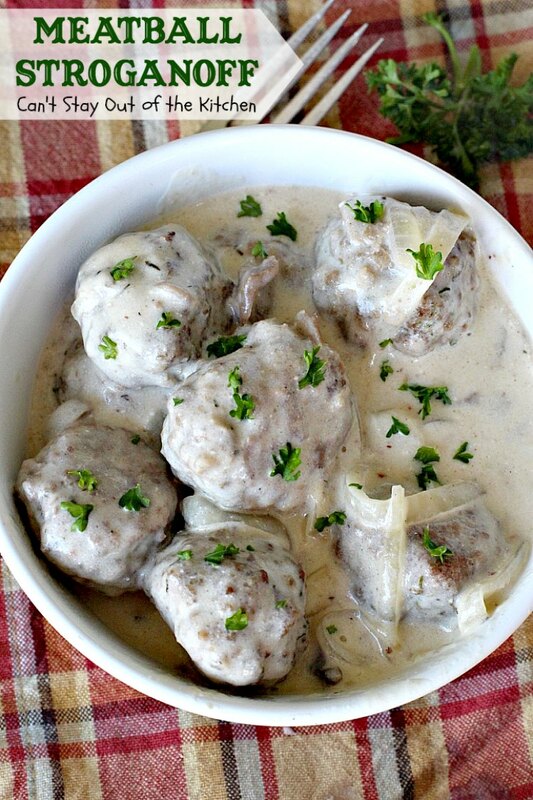 Meatball Stroganoff is one of the most mouthwatering recipes I’ve ever made. 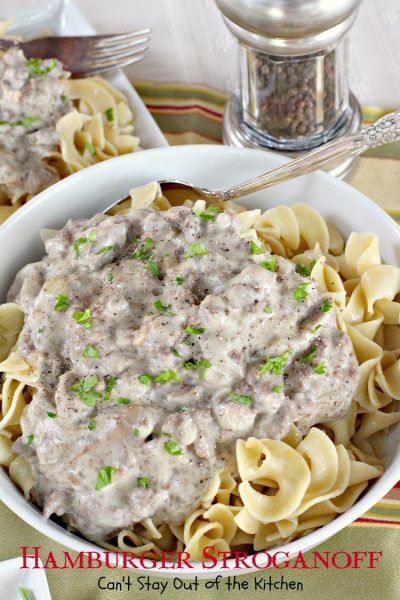 I love Beef Stroganoff, and even Hamburger Stroganoff is a recipe our family has enjoyed for years. There’s just something about a creamy onion and mushroom gravy that makes my mouth water. Even though this recipe has some similarity to Swedish Meatballs, it’s not the same. If you are needing a completely gluten free recipe, then you’ll need to purchase gluten free noodles as well. We had this recipe for company so I made regular noodles, but served my portion of Meatball Stroganoff without any noodles (so it was gluten free). The meatballs in this recipe are superb. I used 4C Italian Style gluten free bread crumbs. I get them at Wal-Mart and I’m really grateful I can find gluten free, no HFCS bread crumbs that don’t cost an arm and a leg. I also spiced up the flavor of these meatballs with Worcestershire sauce, Montreal Steak Seasoning, garlic powder and Parmesan cheese. I highly recommend using the highest percentage of lean beef available – 96% lean ground beef or sirloin if you can find it. 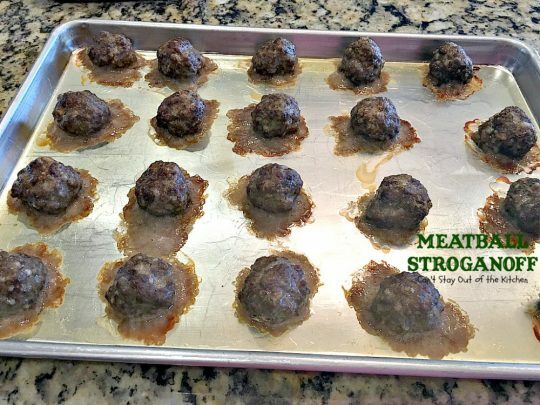 That way if you want to make this in the crockpot you can throw all the ingredients in at one time (including raw meatballs), and you won’t have lots of grease floating on the top. While I actually made this entree on top of the stove (and baked the meatballs in the oven), this is one of those recipes that’s perfect for the slow cooker. I amped up the sauce in this recipe, too. In addition to mushrooms and onions, this one has parsley, dill weed, thyme and more Montreal Steak Seasoning. While I made my sauce a little on the thin side, if you prefer a thicker sauce, simply omit a cup or two of beef broth when adding the ingredients for the sauce. John meets with a guy in our Sunday school class weekly or bi-weekly and they’re currently doing a study on Galatians. Once or twice a month we have them over for dinner before they get together and meet. Then his wife and I walk the neighborhood while they are going through the study. 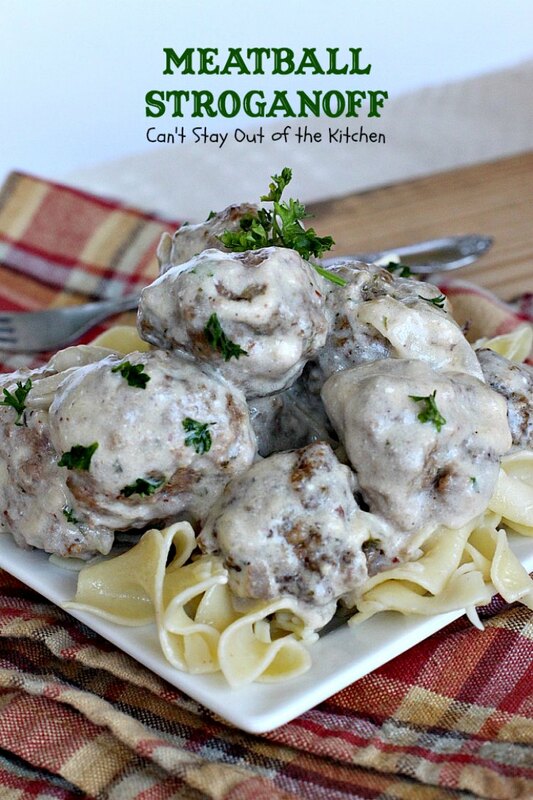 I served this Meatball Stroganoff back in June on one of those occasions when we had this couple over for dinner. They loved the meatballs and the tasty sauce, even going back for seconds. Meatball Stroganoff is a great recipe that you and your kids will love. If you don’t have gluten intolerance, regular bread crumbs and regular flour can be substituted where I’ve used gluten free. 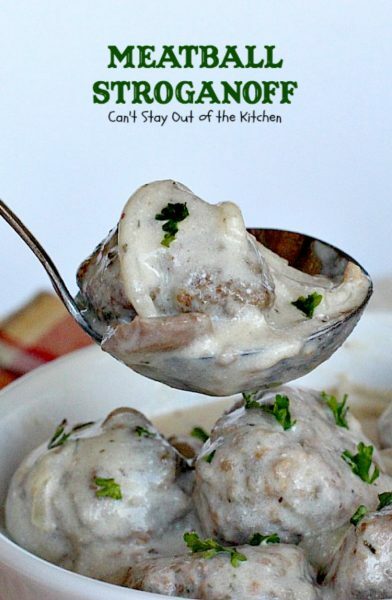 If you decide to make this in the crockpot, I would put everything in the crockpot (including raw meatballs). But don’t add the whipping cream and the sour cream until the end. 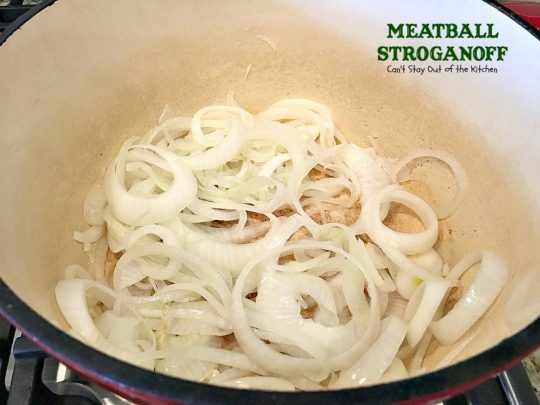 Once the meatballs are cooked through, then add those last two ingredients and stir until incorporated. Whether you make this in the oven and stovetop or in the crockpot, it’s an entree that will be devoured in short order! Meatball Stroganoff was one of those entrees that was greatly enjoyed by our guests and us. The amped up flavors in the meatballs and the sauce make it a cut above many stroganoff recipes. 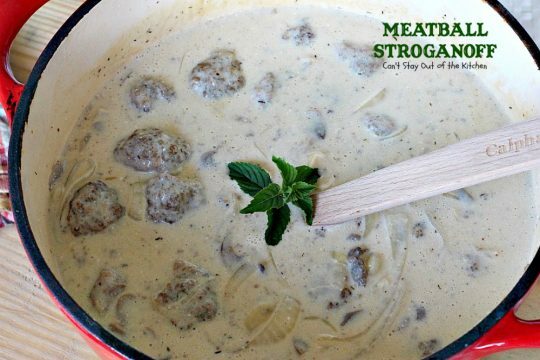 Serve Meatball Stroganoff with hot, cooked, buttered gluten free noodles, if you’re trying to keep this recipe gluten free. This is a great recipe to serve company because it makes a lot. I used these ingredients for the meatballs. I was trying to keep them as clean as possible so I used an organic ketchup without HFCS or sugar. Place meat and remaining ingredients in a large mixing bowl. 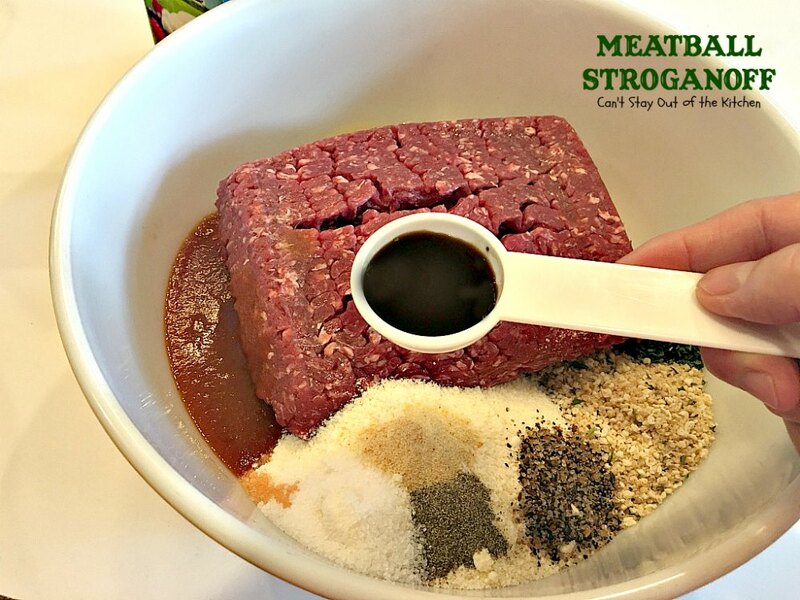 Work beef mixture with your hands until very well mixed. Spray cookie sheets lightly with cooking spray. Roll beef mixture into meatballs. Bake at 350 about 35-40 minutes until well browned. 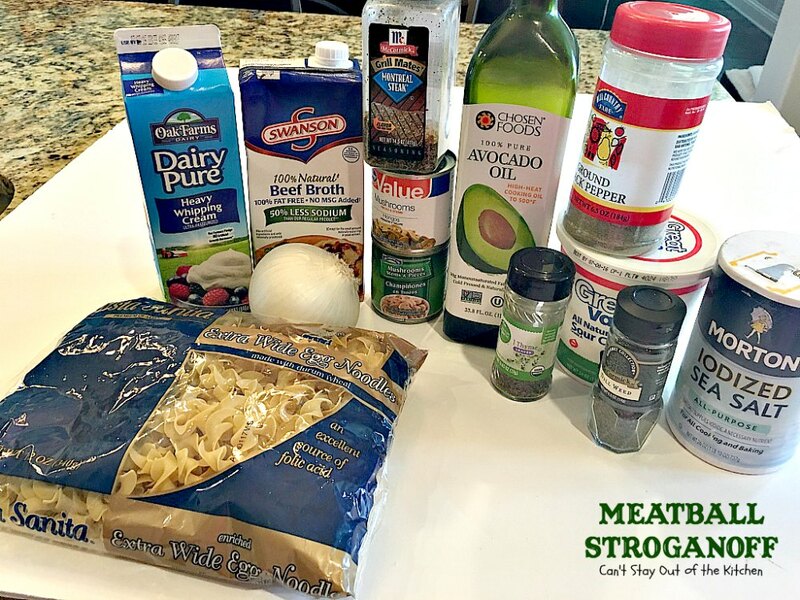 I used these ingredients for the sauce plus gluten free flour. Use gluten free noodles if you need to keep the entire entree gluten free. 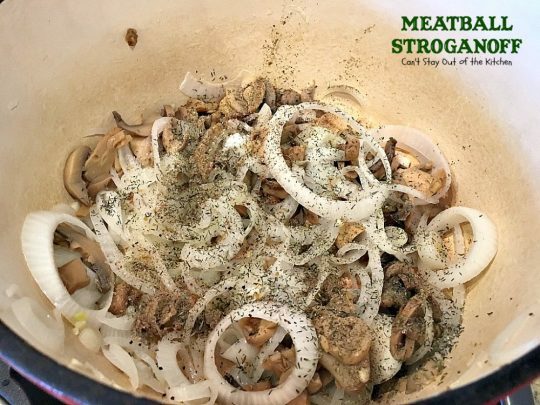 You can also substitute fresh mushrooms for canned (which is what I usually use). I didn’t have time to go to the store before making this recipe, so I used what I had on hand. Pour avocado oil into a Dutch oven. Add sliced onions that have been separated into rings. 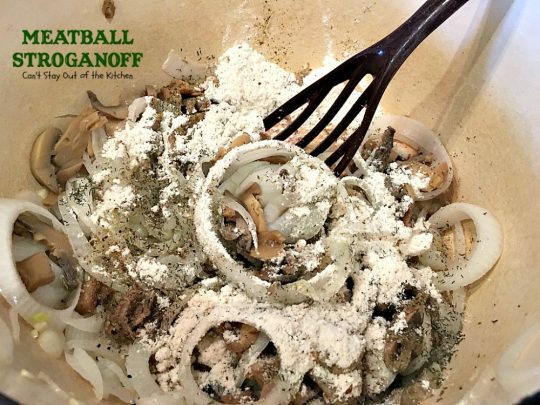 (If using fresh mushrooms, add them here). Work in gluten free flour and cook about a minute. Add beef broth. If you want a thicker sauce than the one I made, decrease beef broth to two or three cups. Cook over low to medium heat and allow sauce to thicken. Add heavy whipping cream and allow mixture to continue to thicken – a couple of minutes. 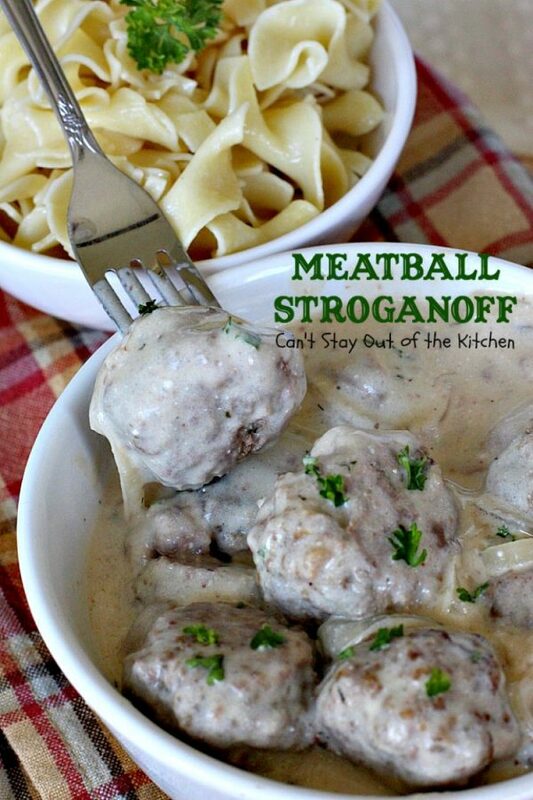 The meatballs and stroganoff sauce make for one happy entree. Yes, my favorite comfort food. 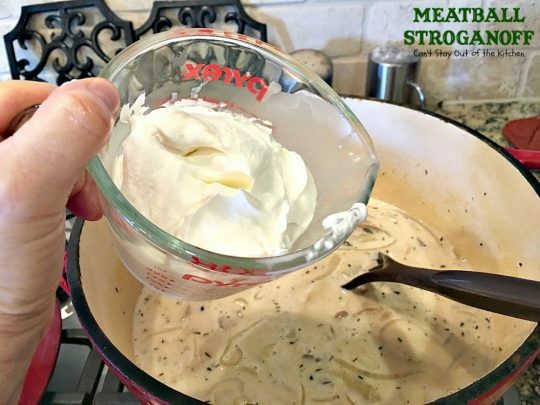 The creamy onion-mushroom gravy with Montreal Steak Seasoning is amazing. 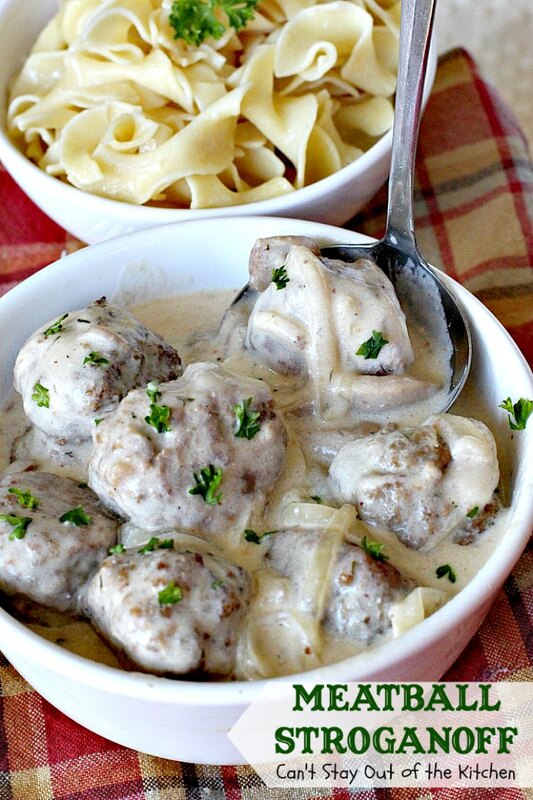 These meatballs melt-in-your-mouth! They are so savory and delectable. 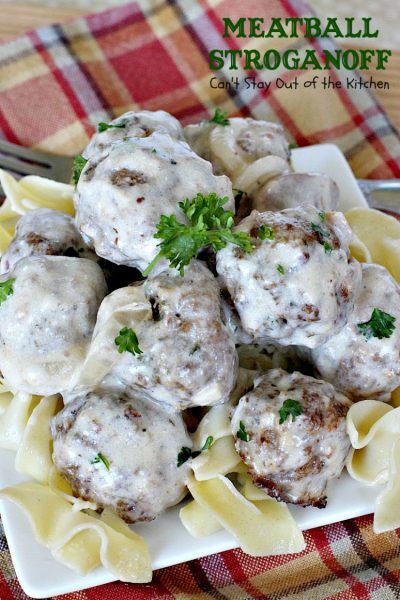 Serve Meatball Stroganoff over hot, cooked, buttered noodles and garnish with fresh parsley. 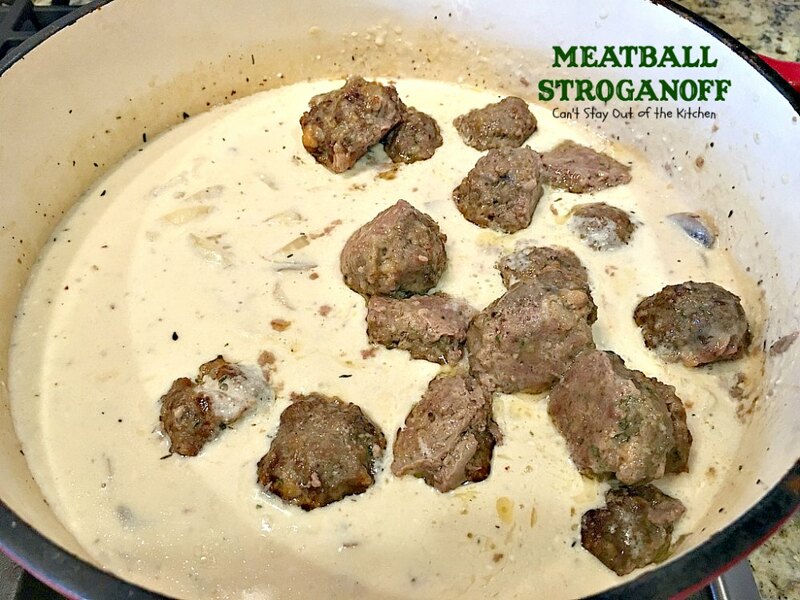 Delicious old-fashioned recipe with amped up meatballs and stroganoff sauce by using Montreal Steak Seasoning, parmesan cheese, garlic powder, Worcestershire sauce in the meatballs and parsley, dill weed, thyme and Montreal Steak Seasoning in the stroganoff. Amazing. Gluten free dish if using gluten free noodles. Combine ingredients in large mixing bowl with hands until very well mixed. 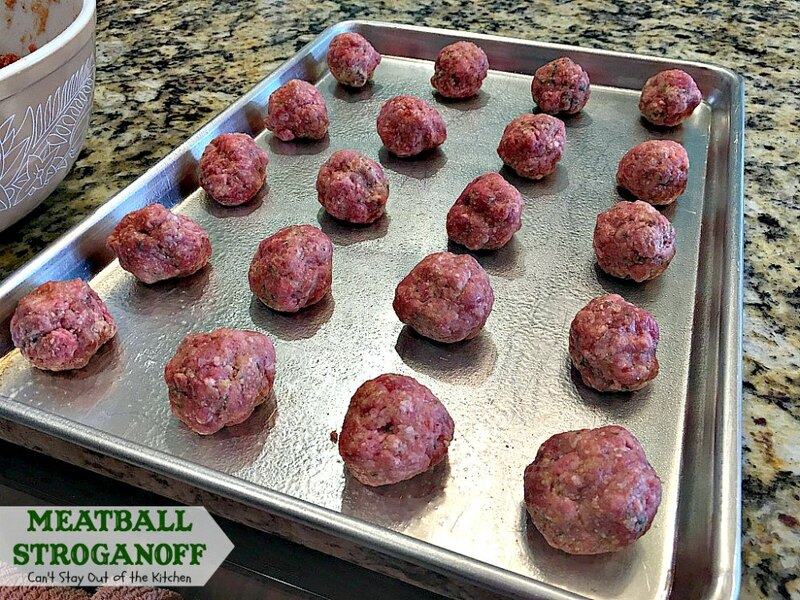 Place meatballs on a greased cookie sheet and bake at 350° for about 35-40 minutes or until well-browned and cooked through. Combine and serve over hot cooked noodles. In a Dutch oven, melt butter or avocado oil. Add onion, mushrooms and garlic and sauté until veggies are tender, about 5-7 minutes. Stir in flour and cook a minute or two. Add salt, pepper, Montreal steak seasoning, parsley, dill weed and thyme. Slowly add beef broth, one-quarter cup at a time and whisk until incorporated. Cover over low to medium heat until mixture thickens and boils. Turn heat to low. Slowly stir in whipping cream. Cook a minute or two until thickened. 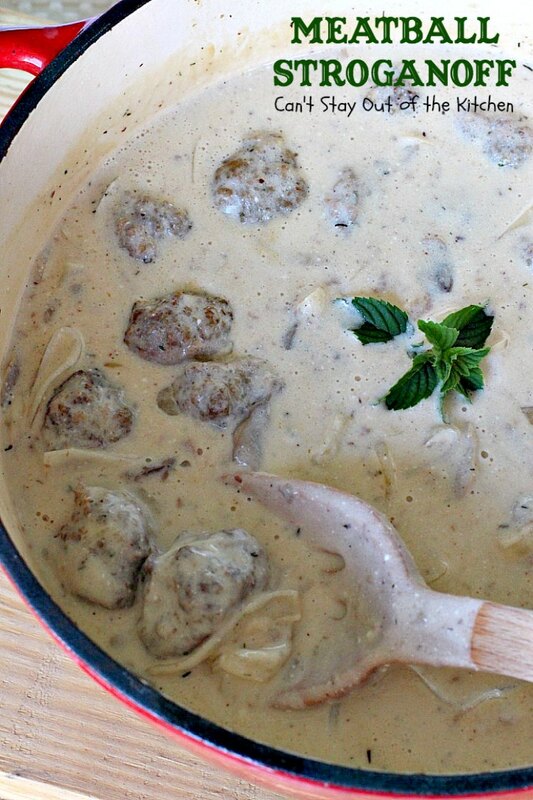 Gently stir in sour cream and meatballs until heated through. Serve over hot, cooked, buttered noodles. 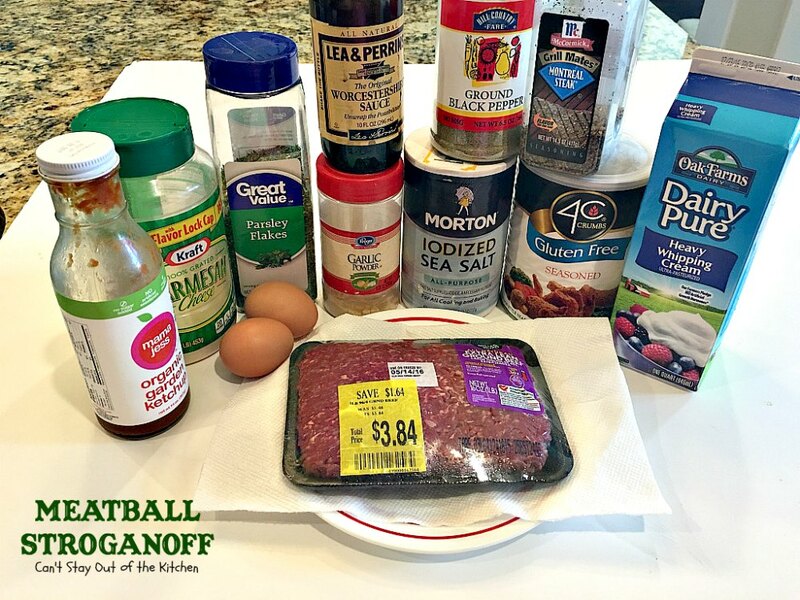 Delicious old-fashioned recipe with amped up meatballs and stroganoff sauce by using [url href=”http://www.mccormick.com/Grill-Mates/Flavors/Seasoning-Blends/Grill-Mates-Montreal-Steak-Seasoning” target=”_blank”]Montreal Steak Seasoning[/url], parmesan cheese, garlic powder, Worcestershire sauce in the meatballs and parsley, dill weed, thyme and [url href=”http://www.mccormick.com/Grill-Mates/Flavors/Seasoning-Blends/Grill-Mates-Montreal-Steak-Seasoning” target=”_blank”]Montreal Steak Seasoning[/url] in the stroganoff. Amazing. Gluten free dish if using gluten free noodles. Add salt, pepper, [url href=”http://www.mccormick.com/Grill-Mates/Flavors/Seasoning-Blends/Grill-Mates-Montreal-Steak-Seasoning” target=”_blank”]Montreal steak seasoning[/url], parsley, dill weed and thyme. 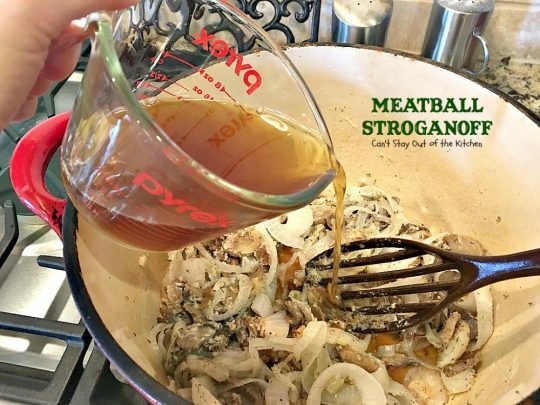 If you want a thicker stroganoff sauce, decrease the beef broth to two or three cups. [br][br]Use gluten free noodles to have a completely gluten free dish. [br][br]To make in crockpot: Spray crockpot with cooking spray. 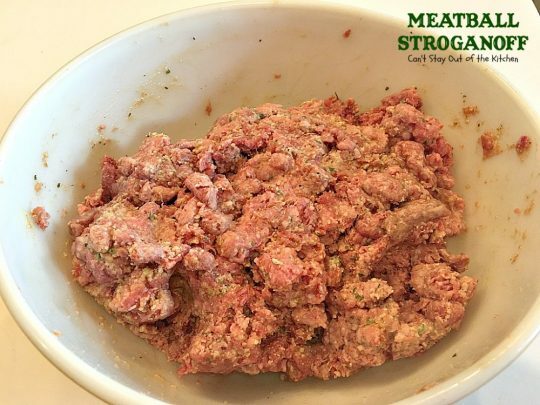 Combine meatball ingredients and place raw in crockpot. 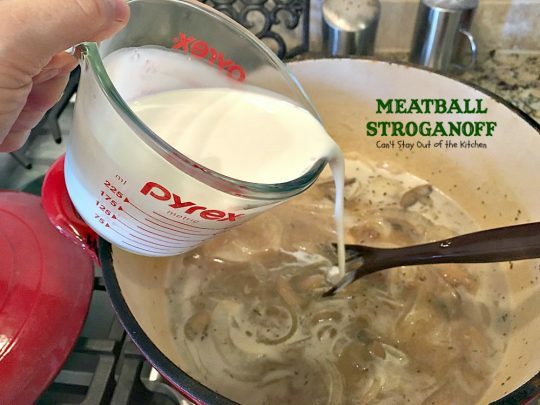 Combine all the stroganoff ingredients EXCEPT whipping cream, sour cream, noodles and parsley for garnish. Pour over top of meatballs. Cook on high approximately 3 hours or until meatballs are cooked through. Add sour cream and whipping cream and heat through. Serve over noodles, garnish with parsley. Everyone raved over this entree. Our guests had two helpings each. I had leftovers for lunch and it was equally good reheated. 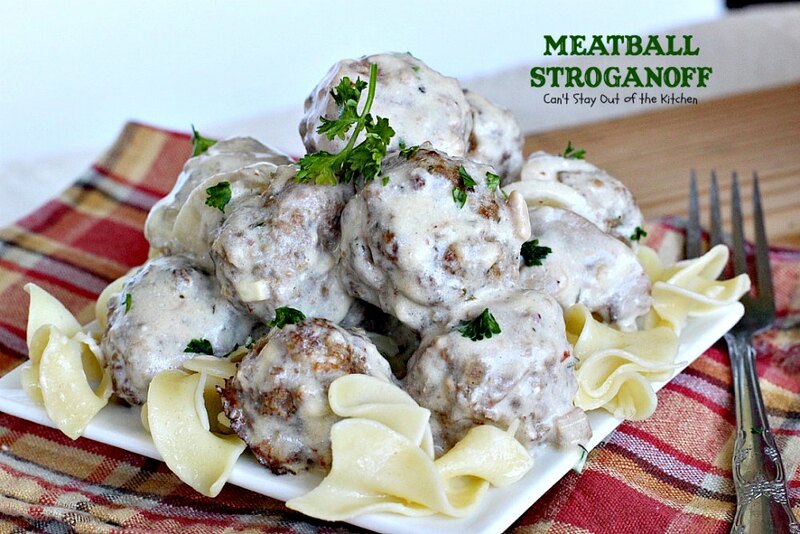 Meatball Stroganoff is a delicious old-fashioned favorite that even your kids will enjoy. Lovely recipe! It looks very similar to one that I’ve made in the past. As a friendly warning – some (many?) Worcestershire sauces contain ‘hidden’ wheat derivative ingredients. Thankfully, a little bit of it doesn’t bother me. Thanks for sharing the recipe Teresa! Hi, Cyndi. I know what you mean about the Worcestershire sauce. That’s why I use Lea & Perrins because it has the least amount of awful ingredients of any of the Worcestershire sauces I can find. Hope you enjoy the recipe. Thanks for stopping by and commenting.